A showpiece of ancient sites, culture and architecture, Uzbekistan is a hidden gem in the heart of central Asia. From the legendary Silk Road, to inspiration behind Taj Mahal, mouthwatering treats to sites that spellbound you, the country has everything to keep you fascinated for days. While Tashkent is a mix of modern and Soviet Era architecture, Samarkand, Termiz and Bukhara stand as witness to its centuries of glory. Treat your senses to a fascinating experience of olden days coupled with a modern insight with our 8-day Uzbekistan Tour. Go through details of your tour in the itinerary below. On your arrival in Tashkent, you will be greeted with a lavish welcome. Meet our tour representative and get assisted with transfer to hotel for overnight stay. Today you will be taken for sightseeing with assistance of guide well-versed in English and foreign languages. Start the day with a visit to Khazrati Imam Complex, a part of Old city of Tashkent. Here you will explore hidden treasures of the bygone days. The highlights of the sightseeing tour are - the Samarkand Kufic Quran also known as the Uthman Quran, Samarkand codex, Samarkand manuscript and Tashkent Quran displayed in the beautiful library-museum. Move on for a visit to Chorsu bazaar area, popular for the 16th-century Madrassah Kukeldash that has now been developed as an Islamic college. Here you can learn more about education system and also pay a visit to one of the classrooms to learn about the calligraphy art. Later, drive out to the suburbs of Tashkent to visit Zangi Ota complex-one of the monuments in the country known for historical and artistic value. After the delightful sightseeing, proceed to Samarkand. Check in at the hotel for overnight stay. Start the day with breakfast at hotel. At the hotel lobby, your guide well-versed in English and other foreign languages will accompany while you go sightseeing. After breakfast meet your expert, foreign speaking guide in the hotel lobby and start with sightseeing tour of Samarkand. Pay a visit to Gur Emir Mausoleum, the final resting place of the Great warlord and statesman Amir Temur (Tamerlane) and members of his dynasty. Move on, and visit Shahi Zinda Complex with the burial-place of Qussam Ibn Abbas, who is said to be the cousin of the Prophet Muhammad (PBUH). There are also many other breathtaking mausoleums displaying stunning mosaic and majolica tile work. The unmissable attractions include Bibi Khanum mosque, Siyab Bazaar, and Registan Square. Pay a visit to Khoja Ahrar complex in the evening, if time allows. Return to hotel for overnight stay in Samarkand. Post a sumptuous breakfast, arrive at the hotel lobby to begin your sightseeing tour with your expert guide. The day is planned to explore Termiz. Enjoy the beauty of a typical Uzbekistan village and their lifestyle. Do not miss to take blessing at the Shrine of Termiziy. Surrounding the city are a number of archaeological sites that reveal the region's Buddhist and Bactrian past, of which many are treasured in Termiz's excellent museum. Later, drive back to Samarkand for overnight stay. Begin the 5th day of Uzbekistan tour with a hearty breakfast at hotel restaurant. After you are done, assemble at the lobby to meet your tour guide to start with sightseeing. Pay a visit to mausoleum of Abu Mansur Al-Matrudi, the great theologian in Islam. Later, you will proceed out of Samarkand and visit the memorial complex of Imam Al-Bukhari, the great Hadith collector. 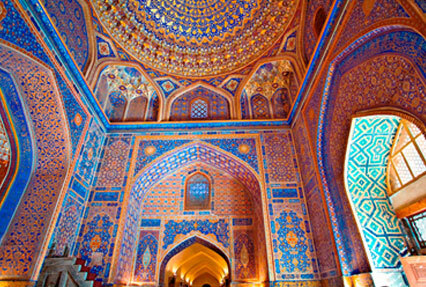 Marvel at the beautiful architectural ensemble built during the years of Independence of Uzbekistan. In the afternoon drive to Bukhara. En-route stop at resting place of Khoja Abdul Khaliq al-Ghujdawani. Continue with your drive. On arrival, check in the hotel for overnight in Bukhara. Wake up and have a healthy breakfast platter at your hotel. Meet with your guide at the hotel lobby and proceed with sightseeing. 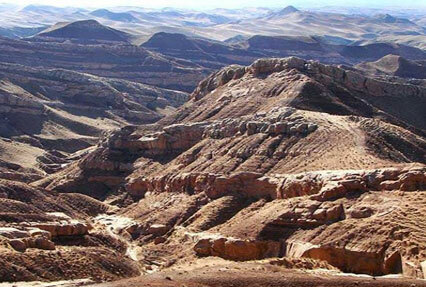 Continue with your ziyarat tour, a holy tour or pilgrimage to tombs of revered Islamic saints. Pay a visit to the resting places of Khojas in the outskirts of Bukhara. Hear the legends of Khoja Arif Riwgari, Khoja Anjir Faghnawi, Khoja Ali Ramitani, Khoja Muhammad Baba Sammasi, etc. Return to hotel for overnight stay in Bukhara. Today, as soon as you are done with breakfast, begin your ziyarat tour accompanied by a guide. Pay a visit to mausoleums of Sayyid Amir Kulal and Baha-ud-Din Naqshband Bukhari. These revered shrines are not just historic gems but are endowed with spiritual bliss. 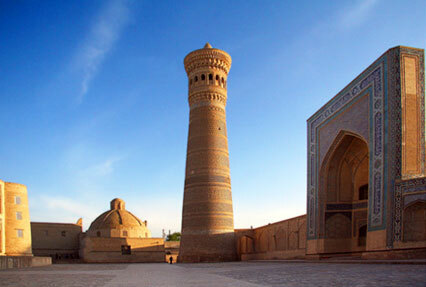 Proceed with a city tour of Bukhara. The highlights of the day are - Samani Mausoleum, Bolo Hauz mosque, Poi Kalon Ensemble of Kalan Minaret, Kalan mosque and Mir Arab Madrassah Trade domes and Lyabi Hauz. In the evening go shopping for local handicrafts. The colorful markets offer great bargains, for you to take home as souvenirs of Uzbekistan. Overnight stay in Bukhara. Today is the last day of your tour. Have breakfast at hotel restaurant. 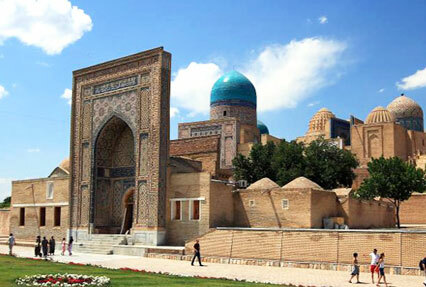 Pack your bags and avail assisted transfer to Bukhara airport for flight to Tashkent. 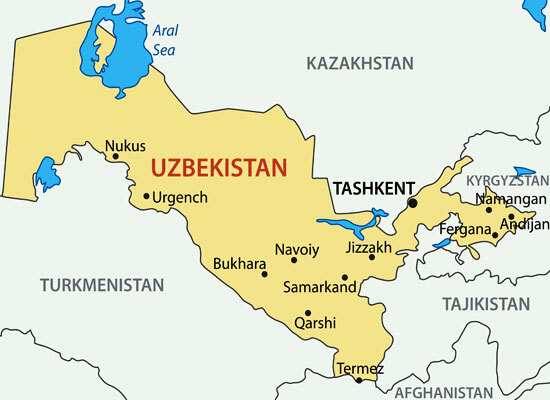 On arrival at Tashkent domestic airport, meet your guide for Tashkent city tour. The capital city of Uzbekistan is charming to explore. The cosmopolitan, green city with wide streets, a lots of parks, fountains, museums and theaters is amazing to explore. 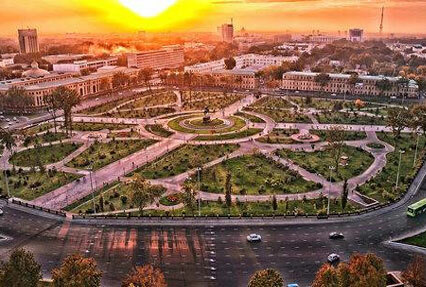 Pay a visit to Amir Temur Park, Earthquake monument, Applied Art Museum, etc. Also walk along Independence square. End the tour with a ride in Tashkent Metro. In the evening, transfer to international airport for departure flight with fond memories of Uzbekistan.